I have been nagged by you nice people in the comments to watch this movie for I think a year now. And I finally did it!!!! Which means your nagging works, and you should keep it up. What I love about this movie is that it starts at the beginning. Not when the attack happens and hostages are taken, but long before that. It takes it’s time showing why people would be in this place, would be driven to such extremes. How they have been hostages of their situation long before they arrived in this dangerous place. And because it starts at the beginning, it doesn’t give you easy answers. Yes, this one discrete problem has been resolved. But the larger problems still exist, and therefore these people, and others like them, are still in danger and will remain in danger. The one downside is that, with spending all that time starting at the beginning, it doesn’t really have a chance to spread out the way it could. That is, we don’t get the full sweep of everything that goes into solving this situation, we don’t see all the people who were involved, every little moment of decision and discussion and so on. We see some of it, enough to get a flavor of what is happening that we aren’t seeing, but then we jump away. And get a flavor of what is happening to our hostages, and then jump away. The whole second half is like that, jump-jump-jump. While the first half is all slooooooooooooooow. But it’s good, the first half gets us completely involved in these characters, in all the complicated pressures on their life, and then in the second half we don’t need a lot of detail of what is happening to draw us in, we are already right there just because we care about them all so much. Partly we care because the performances are so great. Parvathy is predictably brilliant. And chameleon-like, when she is heavily pregnant in the second half, her face gets fuller and rounder, like a pregnant woman’s, and I have no idea how she did that!!!! Kunchacko Boban is predictably generous. He does not get to play the hero’s part, he plays the lover, the supporter, the patient one. And he is left behind by the film for large bits of time, definitely more of a second or even third lead kind of role. Just like he played in How Old Are You? and in Ramante Edanthottam. He’s not there to “save” the heroine, he’s there to be an appreciative audience as she saves herself. Fahad Fazil was the one who really impressed me. Similar to Thondimuthalum Driksakshiyum, he showed up late and did not have an author backed role. But I didn’t even really notice, once he was there, he was so incredibly present that he didn’t need a backstory or an explanation, we just accepted him. It’s good that the cast was so strong, because there were minor weaknesses to the film as a whole. Only minor ones, if it was a Hindi film I wouldn’t have cared. But I have learned to have a higher standard for Malayalam films. But there were little moments that dragged slightly, other scenes that felt like they could have had more impact, and so on. What was done perfectly, and which you would never see in a Hindi film, is that these characters are not always wise or brave or smart. They rise to the occasion because they have to, but it doesn’t mean they are wonderful at all other times. 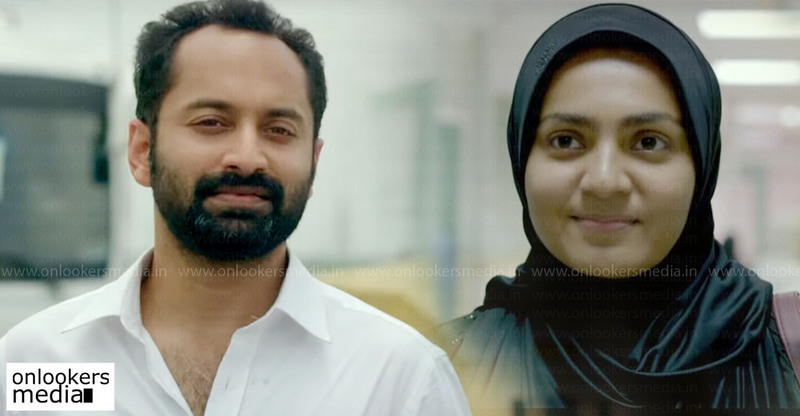 Parvathy is short-sighted and foolish, Kunchacko is weak and too accommodating, Fahad is blindly focused on one goal to the point of alienating people who might be able to help him. They are small human sins, but that is what makes them so unusual for a film, we are used to huge tragic epic flaws in our characters, not just the little human imperfections anyone might have. And we aren’t used to those little human imperfections being ultimately meaningless, left behind once life gets more serious. There is really not much connection between the first and second half of the film, but that is the point. When life gets crazy, all the stuff you used to worry about doesn’t matter at all. The real life story this is based on is pretty simple. 46 nurses, mostly Malayalam, were trapped in a war zone in Iraq. The Indian government, overseas Indian businessmen, and the surprising mercy shown by ISIS, helped to get them safely to neutral territory and then flown to India. It’s remarkable because no one thought they would survive, or ever be able to return home. And because they were such clear innocents and non-combatants, young women, nurses, and not even Iraqi. This film takes that story and asks “why were these helpless women stuck in so much risk in the first place? Where did we fail them?” And over the course of the slow first half of the film, we see how they were trapped, failed, stuck, long before the gunfire starts. We begin with a presentation in a fancy hotel, the speaker is talking about the Iraqi ministry of health, how much they want medical staff members, how they appreciate them, and so on and so on. Kunchacko comes in late and sits next to another man who complains about how this is all lies, the country is the middle of a war zone, no one is safe there. Kunchacko asks why he is thinking about going, the man says “not me, my wife”. This is the problem. Women with medical training in India are so desperate for jobs that they have to go overseas. And it is easier for them to find overseas jobs than their husbands or fathers or brothers or everyone else who would normally take on that responsibility. There’s a lot that goes into this. For one thing, the fact that women’s labor is consistently undervalued which, strangely, makes more “female” jobs available. Nurses, flight attendants, film editors, administrative assistants, computer programmers (back in the old days) are paid less than doctors, pilots, film directors, managers, software engineers. Which means when an entity like the Iraqi Ministry of Health is desperate for medical staff, they will try to fill the void with many many many nurses. Because it is cheaper than doctors. Often in any work environment, there will be a dozen women to one man, for this reason. And when that environment turns dangerous, the one man will have the position of more “value”, and therefore will be saved, while the women will not. From the side of our man who is worried about his wife going overseas, we can fill in that he was unable to find a job to support them in India. And the “male” overseas jobs (construction, sales, small business owner, etc. ), those are no longer available to him either thanks to the recession. And so his wife has to take this job. It’s much worse than what he would be able to find if he could find anything, but since he can’t, it’s the best they can do. The same thing is true everywhere any time there is a recession. Suddenly that part time no benefits job for a daycare that your wife does becomes the sole support of the family, because your good job with benefits is now cut. It leads to upside down articles about “the rise of the woman”, but really it is taking about “the fall of the high paying traditionally ‘male’ jobs”. So that’s one thing that is happening here. Another thing that is happening is specific to nursing and certain regions of the world. Because nursing is in this odd “requires a lot of training and education but has minimal prestige” position, it can fall into this gap where certain places sort of specialize in providing the training and then sending their nurses overseas. You might be nervous about a “foreign” doctor, but if it is “just a nurse”, you don’t mind as much. In America, it is often the Philippines, where schools are good and English is present. It might be harder for a Filipino to break through to a “real” job, a “male” job. But nurse, sure!!! The education is decent, and the person is non-threatening. And you need to hire a lot of them for comparatively little pay, so bringing people in from outside is easier than competing in the home market. And Kerala seems to have become one of those places. Cranking out well-educated nurses and then exporting them all over the world. The economy relies on this, the money has to be made overseas and sent home and spent at home, and thus the state keeps going. These women are benefiting the entire structure of society with their sacrifice. But it is a shameful sacrifice, to admit that your wife or your daughter or your sister or your mother is supporting the whole family, rather than yourself. More likely to tell them they are “abandoning” their child, their responsibilities. And this is what we see from our heroine. She is desperate for this overseas job, this terrible dangerous overseas job. She is missing one of the documents from her application file, and we see her calling her son and her father for help getting it together, finally being rescued by Kunchacko, her co-worker with a crush on her. Seemingly, she is a “damsel in distress”, all of these men are around to help her. But then we see that they are helping her because she is the linchpin, she is the center, and she is doing everything for them. There is a flashback dropped in somewhat suddenly (one of those rougher moments that made me realize this was a first time director), that shows how she came to this. She was a happy married woman. But her father called reminding her of their family debt. She asked her husband for help, he couldn’t speak to his family for her. Her father kept calling, she put it off as her son was still a child. She was pulled by being needed as a daughter, as a wife, and as a mother. And she kept trying to find a place in between those identities, and there just wasn’t one. Everyone needed everything from her. And so now she is giving everyone just part of what they needed. To her son, she gives time on his school vacations and sneaks phone calls while at work. To her father, she gives money but no more respect. To her now ex-husband, she gives the right to keep their divorce a secret. To take this leap overseas, this is a last attempt to clear all her obligations. Pay off her father once and for all. Stop working so hard so she can be a better mother. Finally resolve her situation with her ex-husband. It’s dangerous, but she has no other option in front of her. This is one woman of many, but we are reminded that all the women are in a similar situation. Their parents took loans for their education, and it is their responsibility to pay those loans back. And they are reminded of this crushing weight every day, reminded that their family might rather see them dead than those loans unpaid (as is explicitly said by some characters late in the film). And that is why they, all of them, risk their lives. For their families, for their debts, for the responsibility that they have to pay everything back and more so. Our heroine is just one of many stories. And we see that from the way her son has been “tricked”. He does not realize his parents are divorced because, for him, it is usual for a wife to be working and living away from her husband. There must be many mothers in his world who are doing the same thing. Which isn’t to say her story isn’t interesting. Especially when viewed through the lens of all those responsibilities driving her. She has a man in love with her, Kunchacko, and knows he is in love with her. But she says she can’t take on another “Burden”. So far, all the men in her life have been takers, not givers, the thought of love equals burden for her. But once she is forced into it, she is different. He is no burden at all, he removes burdens. She marries him so her father will agree to let her go out of the country, since she will have a husband with her. And then is surprised to find joy in their marriage. The only small upset is when she gets pregnant and wishes to delay having a child. And Kunchacko realizes she is avoiding motherhood not because she doesn’t want this child, but because she is worried about what her 8 year old son will think if he sees her pregnant. He never forces her, but he expresses his feelings, that he wants this baby, and she wants this baby, and they should not give up this last most important thing for the comfort of someone else, even her own son. And so they go to Iraq, husband and wife together, both nurses, and the wife pregnant. This is the part where the film begins to feel like it is moving a bit too fast. We see them meet a husband and wife doctor team. A quick montage of her growing in size and buying burqas to hide it. And then suddenly it is months later and her son is arriving for his school vacations. And her ex-husband is telling her that his business has failed suddenly, she has to take over expenses and responsibility for their son, who will be living here with her for the foreseeable future. It’s handled a bit clumsily both by the filmmakers and the characters. But I can forgive the second more than the first. For the filmmakers, I could have done with a few scenes indicating that her ex was asking for money, or telling he “we should talk” when he called to arrange the drop off. I can believe that it happened this way, that the woman this is loosely based on took a dangerous job overseas thinking her son would be safe at home, and then had her ex suddenly hand him over. But it felt like the film didn’t set it up as carefully as the rest of the world building. All of that is bad, but what I find wonderful is how it gets woven in to the hero moments at the very end. Parvathy initially gets out of her shell and starts making demands, coming to the attention of Fahad at the embassy, because she wants her husband. After months of denial, of compromise, of telling herself that she had to balance all her needs, it is all rushing in on her. She has to pay him back for everything he has done for her, for the unspoken fact that he is only in Iraq so she could come, that he only took the dangerous two week job away so she could have alone time with her son to recover from the realization that she had remarried. She forgets her job (and the money it will make for her father), her own safety, even her son, in her desperate need to get her husband back. And if we just saw this last bit, it would look like pure guilt. If we came in to them already married and her sending him away so she could be alone with her son, or even suddenly agreeing to his proposal just to get the Visa. But we saw more than that. There was a purpose to that whole slow first hour. We saw how Kunchacko was just there for her, reliable and happy to help. Not overstepping his bounds, but also not being scared off. This was her final sacrifice, this nice interested man, because she had her son and her father and her ex all forbidding her. She only let herself marry him when it became the “responsible” thing to do. And she didn’t let herself enjoy that marriage, didn’t think about having his child or any of the rest of it, tried to cut herself off from that. Until she couldn’t any more, until it all came rushing done on her all of a sudden now, and that recently discovered and felt and acknowledged love, that is what is driving her to risk everything, to stay in this terrible place and try whatever she can to get him back. And so it all brings us to the moments that matter. The desperation that drives these women in general, the love that is keeping Parvathy her and making her brave and determined to live, it gets through to Fahad, our blase embassy official. It makes him notice them and, later, remember them and know how to reach Parvathy and try to help her. The strength these women already have, it keeps them going as they try to survive locked in a room at the hospital, moved in a bus, hiding in a cave. Until, finally, they are brought home. I appreciate that the film keeps that homecoming as a qualified happy ending. We never have a real answer for the women who declared they cannot leave without wages because their parents would rather they were dead then unpaid. We don’t learn if Parvathy was ever able to pay off her school loan for her father. The same punishing needs that drove them into danger may drive them off again. There is no magic wand to solve the bigger problem. Well, at least not until December 22 when the Salman Khan version of this story hits theaters!!!! This entry was posted in Monday Malayalam and tagged Fahad Fasil, Kerala, Kunchacko Babo, Malayalam, Monday Malayalam, Nurse, Parvathy, Take Off by mredlich21. Bookmark the permalink. I got two thirds of the way through this post before I realized it wasn’t about the new Salman movie. Yes, I’m clueless . . .
Once Salman’s is out on DVD, I’m tempted to try to edit them together. Stop 20 minutes before the end of this one, and switch to the ridiculous action heroics involved in rescuing them. It is a first time director, but quite an experienced editor (including Vishwaroopam, Tamil). Received positive reviews back home, and was really well received by the audience. Released in the same week as “Angamaly Diaries” and arguably both will make it to the top 3 Malayalam films for this year. Those two are my favorite Malayalam films of the year (but I think they’re actually the only two 2017 releases I’ve seen!). Both really show the Malayalam industries strengths in storytelling and innovation. Personally, I loved “Thondimuthalum Drikshashiyum” equally well, though I’m not sure if it’s your kind of movie – slow with a threadbare plot. Njandukalude Nattil Oru Idavela, Solo, Parava, Udaharanam Sujatha, C/O Saira Banu, Varnyathil Ashanka, Rakshadhikari Baiju Oppu are other honourable mentions. I saw this this weekend and Parvathy stunned me! I couldn’t believe it was her when she first appeared. Also, this movie made me bawl at the end with the real life footage. I work in the UAE, and the nurses at my school are from Kerala. We had a good chat today about this movie and their own personal experiences. What you described here is so true, the idea of begin hostages in their own households. There were many times in the movie I kept wondering how they could have gotten to that point, hiding things from Ibru and living this double life, and my fiancé had to keep explaining how it’s such a cultural thing that it’s ingrained into life there. this is such fun, going back and being reminded of old reviews as you go through them. And now I am trying to think of another nice pleasant Malayalam film you could watch for a break. Have you seen Amen yet? Gorgeous visuals, happy story. Maheshinte Prathikam is another nice one. Well, he seems to agree with Margaret that these nurses had a worse life in their own house than Iraq and around 15 of them returned back! Thank you! I love it when people post new comments on older reviews. “future visitors” arrive constantly, every time a film hits a new streaming service or is broadcast on TV, and it’s great if you keep adding interesting things for them to read in the comments.